It’s all about of the most visited UK websites list according to the first 10 websites list in the UK “Top Sites” Alexa Internet publishes the list, as of May 16, 2018, along with its rating. Last year’s publication was of the most popular websites in the world where Google was at the top of all. Similarly, this year Google is in the same position in the ranking. This year’s list of the most visited websites the UK is based on the Alexa stats as well. It tracks millions of website users to create lists of the most visited websites by country and internationally. Besides, the rankings of Alexa are made in the base of the daily page views per visitor, % of traffic per search and the total number of sites that link to each website in their list and the estimates of the daily time spent on site per visitor. 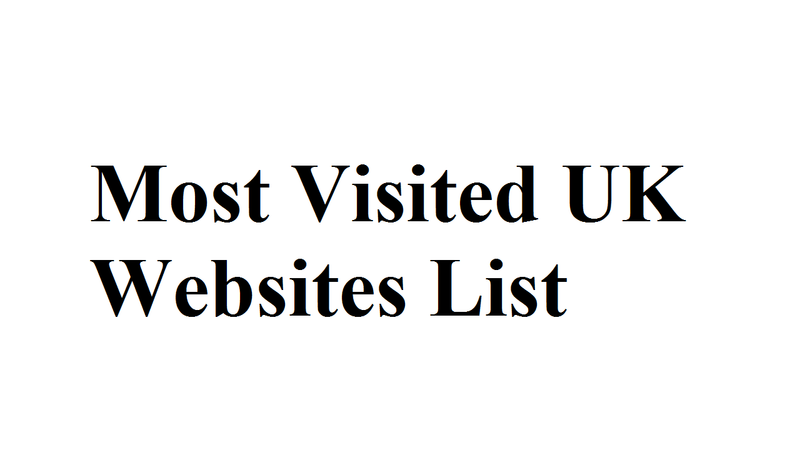 What are the 10 Most Visited UK Websites List? The list of the most visited UK websites has come on the base of the Traffic data for the Top 1,000,000 sites worldwide. Among the most visited UK websites, Google is at the top of all. Not only in the UK but it’s globally top in the most searched websites as well. Larry Page and Sergey Brin is the founder of Google and they found it on September 4, 1998. Currently, Google processes more than 40,000 searches in a second, which is the most of all websites. The site provides a lot of other services being a search engine. These include their popular email service – Gmail, and specialization of searches through blogs, videos, news items, catalogs, etc. Moreover, there are services for mobile devices, social networking tools, organization tools, and chat tools, etc. Besides, Google links to more than 3,560,046 websites all around the world. The users view approximately 9 pages where the average daily time spent on the site is 8:01. Among the most visited UK websites, YouTube is in the second position. This is another venture of Google Inc. In February 2005; three PayPal employees (Chad Hurley, Steve Chen, and Jawed Karim) create the site. YouTube acquires by Google for over $1 billion in 2006. There is every category of video on YouTube because it’s like an ocean of videos. Simply put a search word and get a lot of videos that you’re looking for. The average visitors spend 8:25 minutes on it, and see approximately 5 pages according to the Alexa. YouTube links more than 2,699,220 websites. Apart from the UK top website, YouTube is similarly popular worldwide. Mark Zuckerberg starts this popular social networking site in 2004 when he was in the college dorm room at Harvard. After that, he makes it the most powerful tool for finding people online and it has grown to serve over one billion users worldwide. Facebook ranks at the 3rd position when it comes to popularity, both globally and in the UK according to Alexa stats. Here visits around 4 pages and the average user spends 9:47 minutes on the website. Moreover, Facebook is definitely the site that links to the highest number of sites, which is more than 7,601,185. It’s the comparison to its rivals in the top 10 most popular websites in the world and in the UK as well. Baidu is the Chinese language search engine and the most visiting website in China, which gets underway on January 18, 2000. It comes with multi-media content – MP3 music and movies and it’s a search engine as well. Moreover, it comes as the first WAP and PDA mobile search for the Chinese people. Now, it’s also one of the most searched websites in the UK. Besides, Baidu also provides over 50 other services along with the most popular Chinese language search engine. It’s similar to Qq.com. It’s average the visitors spend 7:54 minutes on Baidu and view 6 pages according to Alexa stats. Most of the internet users know about Wikipedia. This is an online information bank comes for free. Jimmy Wales and Larry Sanger is the founder of the site and they found it on January 15, 2001. Wikipedia attracts most users not only in the UK and US but it has large visitors in Germany, Japan, India, and China. In this website, the visitors spend 4:11 minutes and the average visitor sees about 3 pages. Moreover, 68.40 % of visits to the site come from a search engine according to a prominent stat of Alexa. You can find millions of articles in 287 languages there since it’s a free website. In this rating of the most visited UK websites, Yahoo is one of the pioneers. This is the second most visiting search engine on the web and the oldest one as well. Jerry Yang and David Filo, electrical engineering graduate students are the founders of the site and they found it in January 1994. The site provides a lot of services for its clients. These include Yahoo Directory, Yahoo Mail, Yahoo News, and many more. It’s view approximately 3 pages per visit and the users spend around 4:05 on average on the site. Google’s UK version is Google.com and it’s made to search the whole web or only webpages from the UK. This one is at the number 7 position of Google.co.uk according to the Alexa global ranking. Its view approximately 11 pages and the users spend 8:06 minutes on the site on average. The website attracts visitors from the US, Canada, Australia, and Germany while over half of its users come from the UK. The average user spends the longest time (15:53 minutes) on the site, comparing to the rest of the websites that rank in the most popular top 10, which is an interesting stat about the site. The site has a bounce rate of 25.50% and the visitor views about 10 pages on average. Qq.com is also the 2nd most popular website in China and ranks number 9th by Alexa. The site also attracts users from Japan, South Korea, US and the UK, but 92.3% of the visitors come from China. Usually, the site sees around 4 and the average visitor spends 4:38 minutes on the site. Taobao ranks globally as number 10; however, it is ranked as 3rd most popular website according to Alexa. But, it’s 3rd most popular website in China in the rank. Besides, the users visit around 4 pages and the average user spends 8:52 minutes on the site.